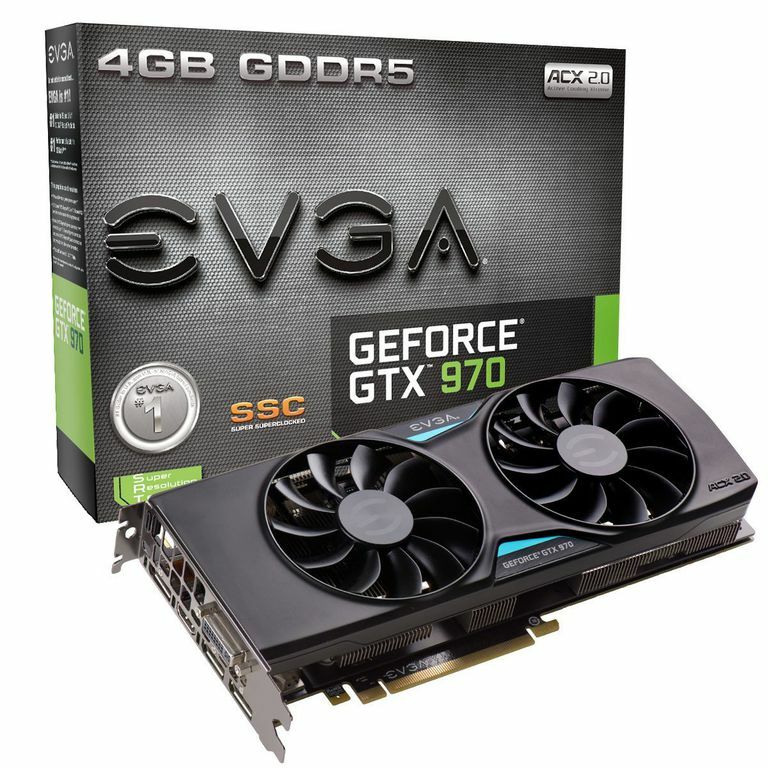 EVGA GeForce GTX 970 SSC Gaming ACX 2.0+. For those looking to play PC games at 2560x1440 resolutions or using multiple 1080p monitors, the EVGA GeForce GTX 970 SSC ACS 2.0+ offers a very capable card. It is also good for those looking to get a somewhat quiet desktop gaming platform without having to step up to a liquid cool setup. NVIDIA'S GeForce GTX 970 graphics processor has been on the market for quite some time now but it may still be some time before affordable NVIDIA Pascal based cards become available. This is considered a mid-range card by many gamers but for the average consumer, its price tag of over $300 makes it a performance class card. EVGA has a long history of making solid graphics cards that offer some of the best performance available. This version is in their SSC category that offers much higher base clock rates than your traditional GTX 970 meaning you probably won't even need to overclock it but there is still room for those willing to push it even further. The card itself does not look all that remarkable when compared to many other GTX 970 based cards. it uses a standard dual width design and features 10.1-inch length that should allow it to fit into most desktop systems. The cooler features twin fans compared to the single fan reference design from NVIDIA with its shroud. This helps keeps the temperatures of the card down and helps reduce the noise as the fans can spin at a lower speed compared to a single fan design. In fact, it rarely needs to spin up to high speeds unless it is in a poorly vented case playing games for extended periods of time or in extremely hot ambient temperatures. It features a one HDMI 2.0 connector and three DisplayPort 1.2 which allow it to support up to 4K resolutions. There is a single DVI port for use with older digital or analog displays. EVGA and NVIDIA recommend a 500 watt or higher power supply but you can likely get by on a smaller 450-watt power supply if it offers a sufficiently high 12V rail. The card requires a 6-pin and an 8-pin PCI-Express power connector from the power supply. It does feature a converter cable that will change two 4-pin Molex connectors to a single 8-pin connector. But what about performance? Well, if you only have a single 1080p Display, this card is essentially overkill. It can run any game at the highest detail levels with maximum filtering and still be able to easily pull 60 frames per second for a silky smooth image. Frankly, this care is overpowered for this resolution. Consumers with that kind of setup would be better off purchase a GTX 950 or 960 graphics card for much less. Stepping up to the next resolution stage is 2560x1440 found in many 27-inch and wide screen 30-inch displays. This is probably the best match-up for a single GTX 970 card. For the majority of games, it will be able to run at the highest detail levels with lots of filtering and still be able to pull 60 frames per second for that extremely smooth and fluid image. There are a few games that will start to tax it such that filters or detail levels may need to be downgraded somewhat. Once you reach up to the 4K or UltraHD displays, the GTX 970 cards begin to stumble. It is possible to play games at this resolution but users are going to have to start compromising on quality levels, frame rates or both. To really play these games, you have to look at the far more expensive GTX 980 or be willing to have two GTX 970's in an SLI configuration to get reliable frame rates and image quality. But what about running multiple displays? Users of two or possibly three 1920x1080 displays will probably find this card to work extremely well for them. A dual display setup should run perfectly well as this resolution puts the pixel count at roughly the same as a single 2560x1440 display. Most games will run at the maximum detail levels with the 60fps. Three-panel setups which are generally preferred will also work well but detail levels of frame rates will have to be dropped somewhat. If 60fps is a requirement, expect to have to drop detail levels. If you can handle roughly 40fps, then detail levels can remain higher. This is all dependent upon the game being played of course. One of the reasons why I really like the EVGA branded cards over many other is the support. The company does a great job standing behind their products. In addition to this, they have the Step-Up Program. This essentially lets owners upgrade to a newer card within 90-days by sending their card in and just paying the difference between your current card and the upgrade model. This is especially useful for a card such as this that could potentially be replaced with a newer model in coming months or if you might consider upgrading to a higher level card because you want more or a higher resolution display. Does NVIDIA's GTX 1060 Match AMD's RX 480?